ABC11 remains in First Alert Mode as heavy rain, high winds and thunderstorms are possible across the area Tuesday. The storms moved through central North Carolina on Monday evening, bringing high winds, thunder and lightning. 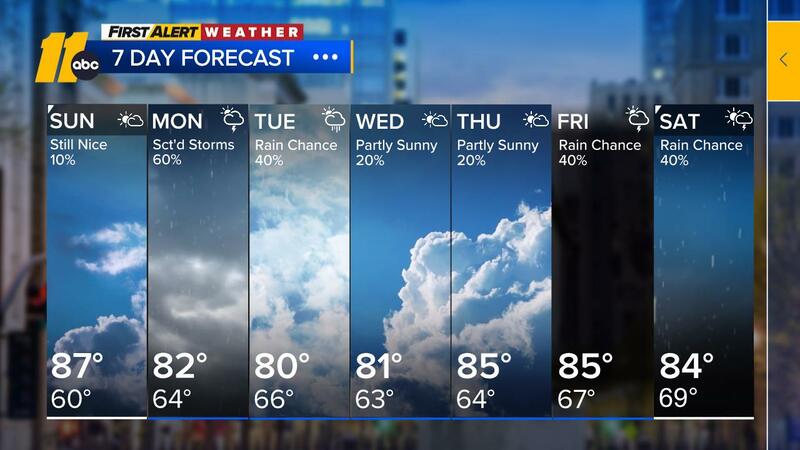 While the chance for severe weather is lower Tuesday than Monday, meteorologist Brittany Bell said the storms still have the chance to bring high winds, hail, and an isolated tornado. The weather should be tame for the most part; however, the Sandhills and surrounding areas have a slight risk for severe weather. Monday's storms wreaked havoc on central North Carolina. In Cary, a large tree fell onto a house. Strong winds knocked over a carport in Nash County, while officials in Apex said a lightning strike caused a model home fire. Earlier Monday, power was knocked out at UNC-Chapel Hill after a lightning strike tripped a circuit at the Cameron substation. Power was restored shortly before 7 p.m., the university said. By evening, the threat had subsided in most areas, but wind gusts, lightning and heavy rain were still possible in the Fayetteville, Goldsboro, Smithfield, Clinton, Lillington, Wilson and nearby areas. Temperatures will remain in the 70s all week; rain shower chances remain high throughout the week.